1815 – Henry Highland Garnet is born in New Market, Maryland. sermon before the House of Representatives. off the coast of South Carolina. 1919 – Alice H. Parker patents the gas heating furnace. cause her to interrupt her career a number of times. player in their basketball game. 1990 – Wendell Scott joins the ancestors in Danville, Virginia. Lightning,” that starred Richard Pryor as Scott. claimed more than 300 lives. A better title for this post might be “Readers’ Advisory on Twitter” but making up a word was more fun and less jargon-y. Anywho, I have a break from school until classes start back up at the end of January which is very exciting. 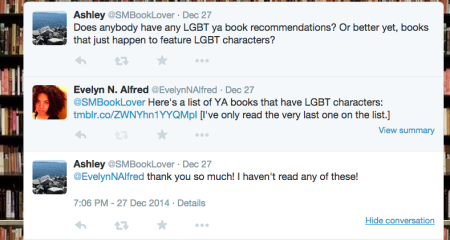 During that time I plan to – when I’m already on Twitter – search for people who have asked for book recommendations. I’ve been doing it sporadically for some time, sparked by the “Slam the Boards” assignment I had last spring (2013). I enjoy it and there’s a chance that the folks I interact with will go to their library to pick up these books. Muahhhaaa, my hidden agenda uncovered!! 1938 – Mateo Rojas (Matty) Alou is born in Haina, Dominican Republic. succumbing to complications of diabetes. On this day in 1959, a glamorous athlete by the name of Delorenz Florence Griffith Joyner is born. She will win three gold medals at the 1988 Summer Olymic and a silver medal in the 1600-meter relay. She will join the ancestors on September 21, 1998.
after battling prostate cancer and liver ailments. complications of AIDS at the age of 49.